Yesterday was the first day of fall. It doesn't feel that way around here--it was +27 yesterday. We haven't had a frost yet. 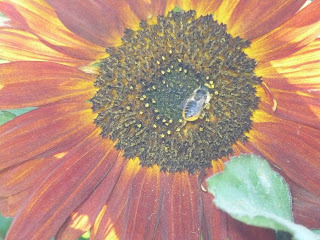 Honeybees are still visiting the few remaining sunflowers in my garden. It doesn't feel like fall at all. But it is, and the last of the veggies are being harvested out of my wee garden. Preserves are being made, and winter planning is going on. At times like this, I sometimes pause to reflect on the abundance in my life. 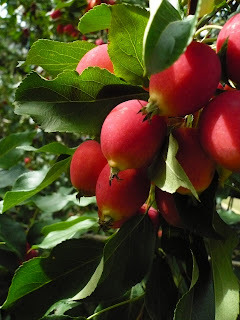 Not just the bumper crop of crab apples, but the things that really count. I have great friends, a wonderful family, a home of my own, a few little luxuries. I have a passtime that I love, that has evolved into a career of sorts. I have the freedom to express myself without fear of serious repercussions. I have more opportunities than I know what to do with. My life is abundant in joys and laughter. But sometimes, abundance just gets out of hand. Somewhere along the line, I decided that this would be a good idea. 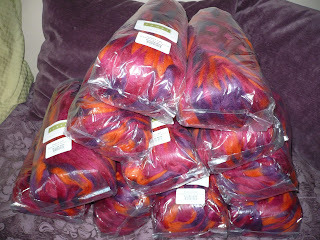 I'm sure the planned project will turn out to be fabulous, but right now, that stack is a little daunting.